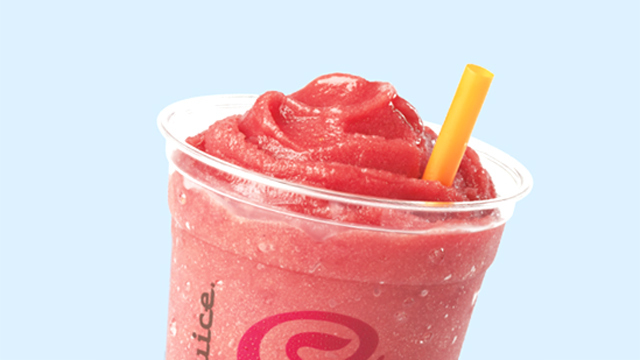 Try it at their brand-new branch in Mall of Asia! 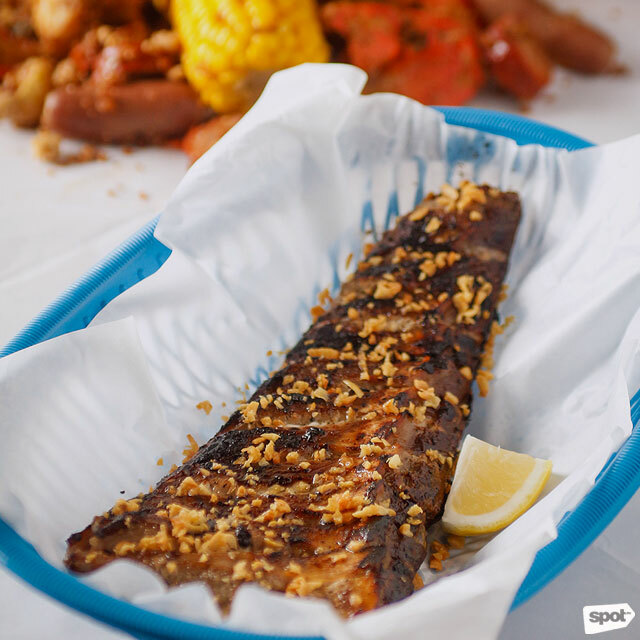 (SPOT.ph) Davao's beloved Blue Posts Boiling Crabs and Shrimps just opened their second Manila branch. 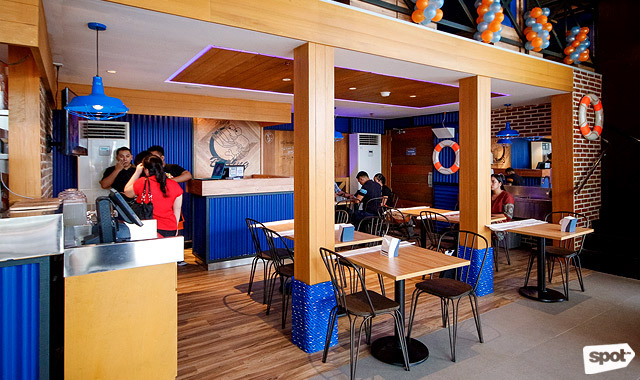 The SM Mall of Asia outlet, decked out in shades of bright blue and orange, is designed to give off a welcoming nautical vibe. 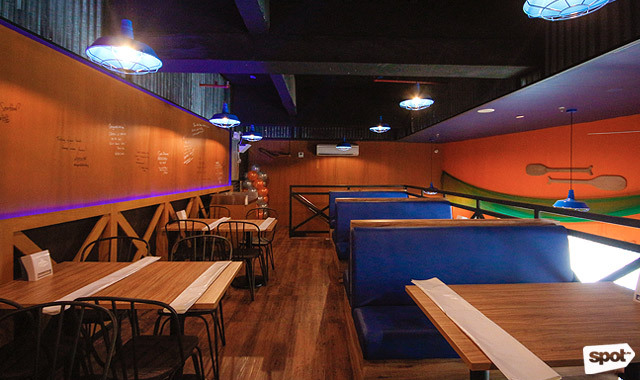 Guests can dine on one of the restaurant's two indoor levels, or al fresco facing the bay. Customers can also write their thoughts on the freedom walls. Each table is provided with rolls of wax paper—fair warning that things could get messy here. If you haven't had the Blue Posts dining experience yet, then you must know they don't offer plates and silverware. Instead, the servers lay out the wax paper, offer bibs and plastic gloves, and then dish out your food right on the table. There's just no better way to eat here! 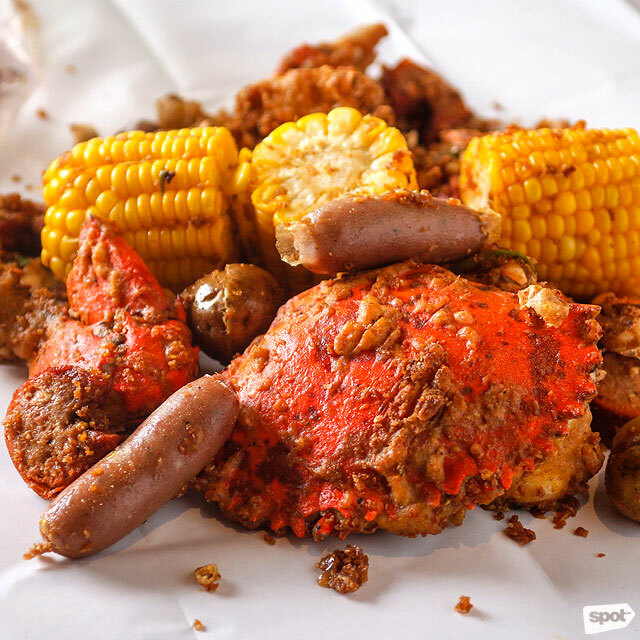 There are two new flavors for the menu's main item, the Captain's Catch, which gives you the choice of crabs (market price), shrimps (P573), or mussels (P589) cooked to your preference. You may also choose the heat level (regular, mild, or super spicy). And the following extras may be added for a more flavorful and colorful serving: corn on the cob (P45), potatoes (P45), pork sausage (P45), Hungarian sausage (P82), or plain rice (P55). Different types of local vinegar are available for dipping. 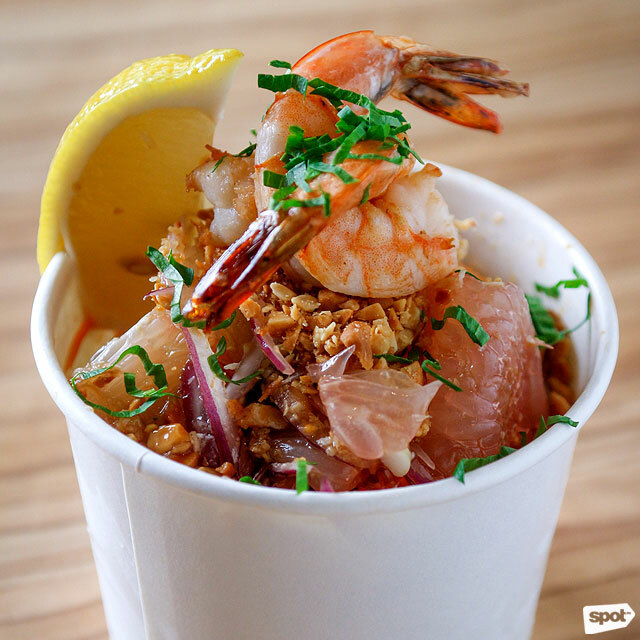 An order of the Captain's Catch is good for sharing, but no one will judge you for having a whole serving to yourself. 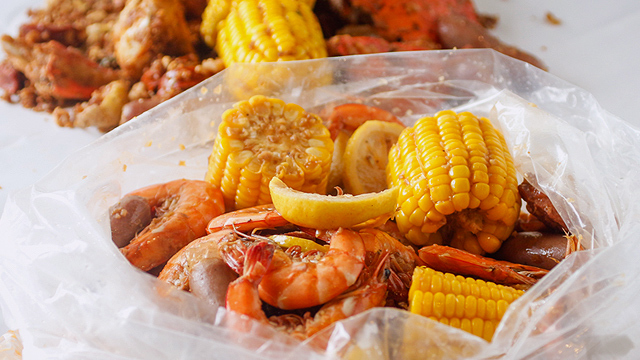 Each bag is filled with fresh seafood; they even show you the live crabs before they are cooked. 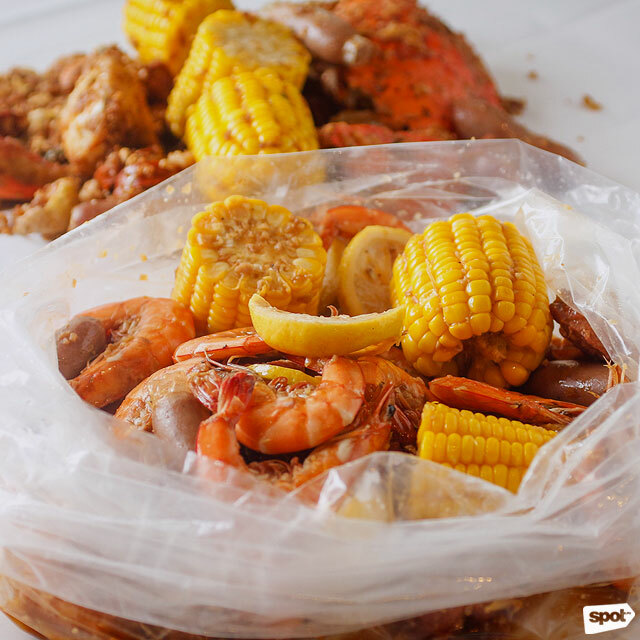 We sampled the new flavors: the Garlic Lemon Butter Shrimps, which has a more refreshingly tangy profile, and the Salted Egg Crabs, which has a balanced blend of buttery and salty tastes. 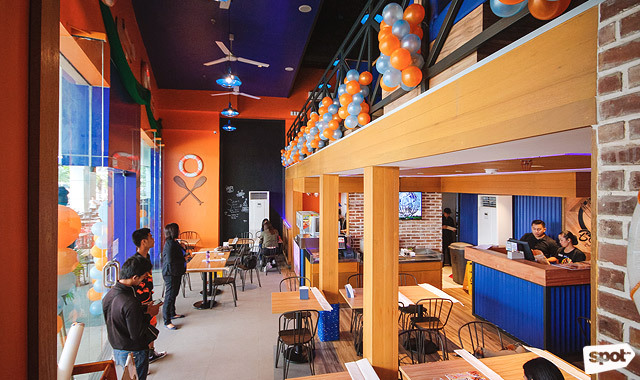 The three original flavors—Blue Posts Boil (using their signature Cajun sauce), Garlic Fried, and Sambal—are still on offer. The bestsellers are also worth a try, like the Pomelo Salad (P195), which cools the palate but also brings a nutty kick. 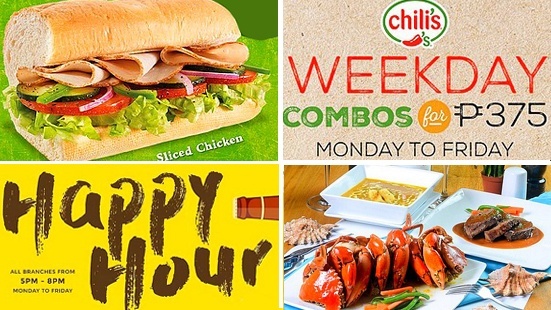 For the grilled options, the Tuna Belly (P445) comes highly recommended. The huge slab is nicely charred on the outside and topped with toasted garlic, and it nicely marries the taste of fresh tuna and the hint of smoke. For dessert, go for the Mudslide (P89). 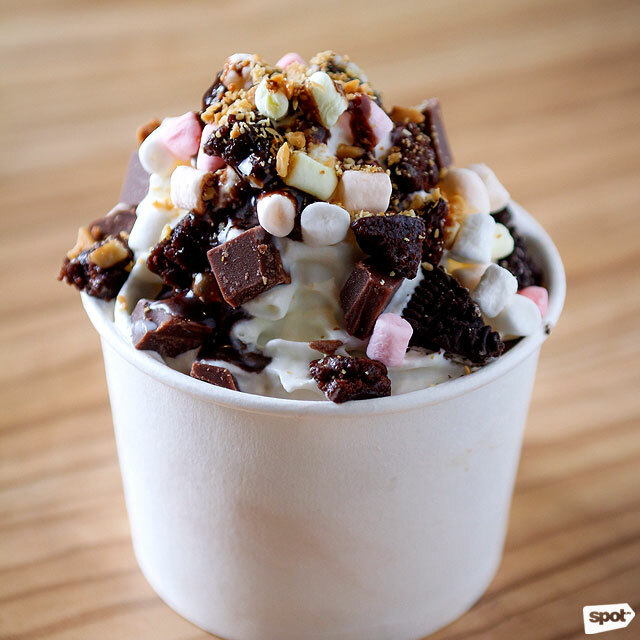 It's chocolate ice cream topped with all the good stuff, like marshmallows, brownie and cookie bits, and nuts. 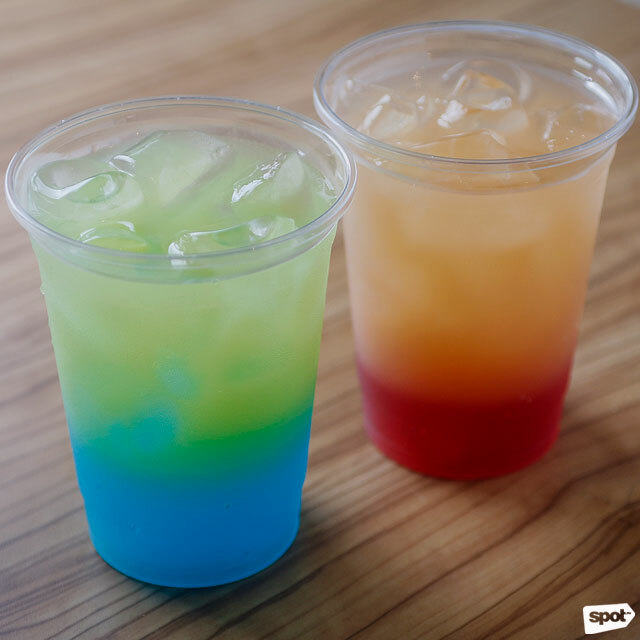 For drinks, Blue Posts also offers the Juices Mixology (P69), where you or your server can mix and match different fruit juices in one cup. Blue Posts isn't done expanding. 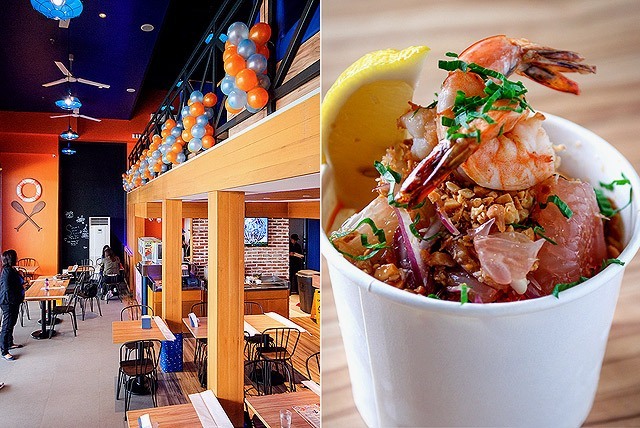 We were told at least a couple more Manila branches will open this year, which will allow even more seafood-crazy Manila diners to enjoy this Davao favorite.